Most of the Pro Patria surtaxed stamps issued between 1944 and 1951 feature the themes of Landscapes and Buildings or Sports. 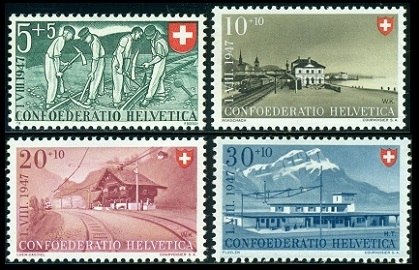 Some sets contain one or more Swiss stamps depicting occupations. One may notice that the dates on many of these stamps are expressed as "1.VIII". The Swiss National Day holiday is actually on August 1 of each year. 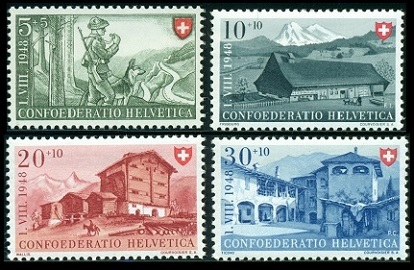 The Pro Patria Swiss stamps are issued well in advance of the actual holiday. The four Pro Patria surtaxed stamps shown above (Zu. WII #22-25, Mi. #431-34, Sc. #B133-36) were issued on June 15, 1944 to celebrate Swiss National Day. 05 C. + 05 C. - View of Heiden. 10 C. + 10 C. - Site of the Battle of St. Jacob an der Birs. 20 C. + 10 C. - View of Mesocco Castle. 30 C. + 10 C. - View of Basel Cathedral. 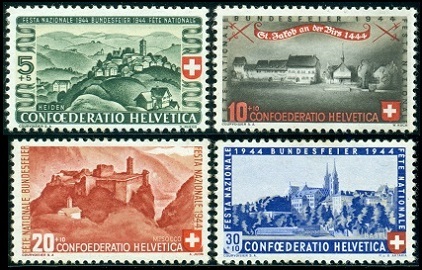 The 10 C. + 10 C. and 20 C. + 60 C. denomination surtaxed Swiss stamps and the souvenir sheet shown above (Zu. WII #19-21, Mi. #443-44 (Block 11), Sc. 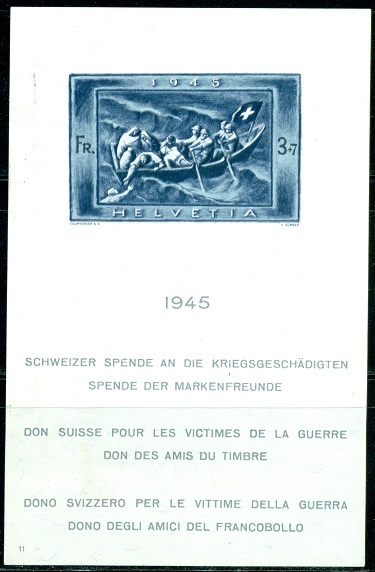 #B141-43) were issued on February 20, 1945 to publicize the Swiss Contributions to the Victims of World War II. The two small stamps depict the symbol of Faith, Hope, and Love. The 3 F. + 7 F. stamp in the souvenir sheet depicts a Lifeboat Rescue. The size of the souvenir sheet is 70 x 110 mm., and it sold for 10 Francs. The surtax on the stamps and the proceeds from the sale of the souvenir sheets benefited war victims. The four Pro Patria surtaxed stamps shown above (Zu. WII #26-29, Mi. #460-63, Sc. #B146-49) were issued on June 15, 1945 to celebrate Swiss National Day. 05 C. + 05 C. - Silk weavers. 10 C. + 10 C. - Farmhouse in the Jura Region. 20 C. + 10 C. - Farmhouse in the Emms River Valley. 30 C. + 10 C. - House in Eastern Switzerland. The four Pro Patria surtaxed stamps shown above (Zu. WII #30-33, Mi. #471-74, Sc. #B154-57) were issued on June 15, 1946 to celebrate Swiss National Day. 05 C. + 05 C. - Cheese makers. 10 C. + 10 C. - Farm buildings and vineyards. 20 C. + 10 C. - House in Appenzell. 30 C. + 10 C. - House in Engadine. The four Pro Patria surtaxed stamps shown above (Zu. WII #34-37, Mi. #480-83, Sc. #B162-65) were issued on June 14, 1947 to celebrate Swiss National Day. 05 C. + 05 C. - Railroad workers. 10 C. + 10 C. - Rorschach Railroad Station. 20 C. + 10 C. - Lüen-Castiel Railroad Station. 30 C. + 10 C. - Flüelen Railroad Station. The four Pro Patria surtaxed stamps shown above (Zu. WII #38-41, Mi. #508-11, Sc. #B174-77) were issued on June 15, 1948 to celebrate Swiss National Day. 05 C. + 05 C. - Frontier guard. 10 C. + 10 C. - House in Fribourg. 20 C. + 10 C. - House in Valais. 30 C. + 10 C. - House in Ticino. The four Pro Patria surtaxed stamps shown above (Zu. WII #42-45, Mi. #525-28, Sc. 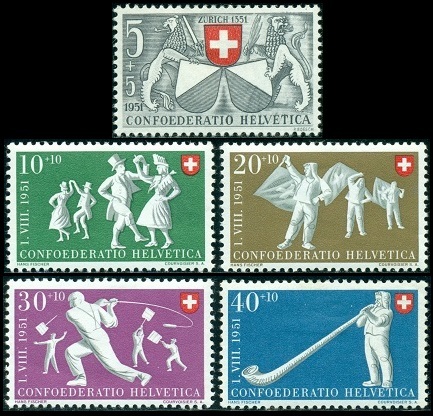 #B183-86) were issued on June 15, 1949 to celebrate Swiss National Day. 05 C. + 05 C. - Postman. 10 C. + 10 C. - Mountain farmhouse, Jura Region. 20 C. + 10 C. - House in Lucerne. 30 C. + 10 C. - House in Prattigau. The 5 C. + 5 C. denomination stamp shown above (Zu. WII #46, Mi. #545, Sc. #B191) was issued on June 1, 1950 to celebrate the 100th Anniversary of the First Postage Stamp of the Federation of Switzerland, issued in 1850. The four sports-themed Pro Patria stamps shown above (Zu. WII #47-50, Mi. #546-49, Sc. #B192-95) were issued on June 1, 1950 to celebrate Swiss National Day. 10 C. + 10 C. - Putting the Stone. 20 C. + 10 C. - Wrestling. 30 C. + 10 C. - Running. 40 C. + 10 C. - Target Shooting. 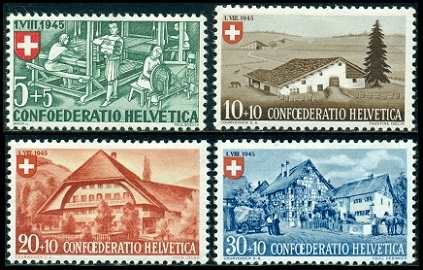 The surtax on these stamps benefited the Society of Swiss Art History and the Red Cross. The 5 C. + 5 C. denomination stamp shown above (Zu. WII #51, Sc. #555, Sc. 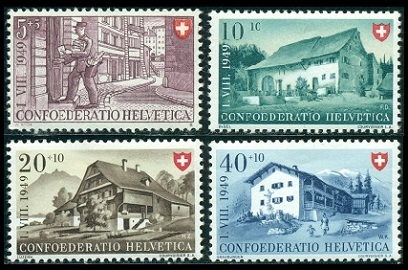 #B201) was issued on June 1, 1951 to celebrate the 600th Anniversary of Bern Joining the Old Swiss Confederation in 1351. 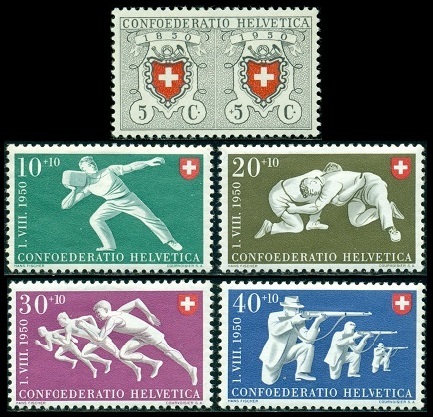 The four sports-themed Pro Patria stamps shown above (Zu. #52-55, Mi. #556-59, Sc. 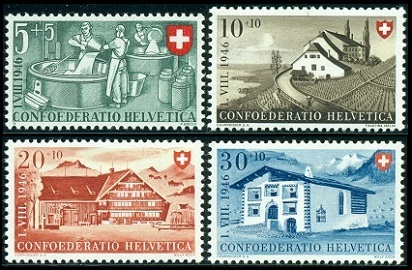 #B202-05) were issued on June 1, 1951 to celebrate Swiss National Day. 10 C. + 10 C. - Valaisan Polka. 20 C. + 10 C. - Flag Swinging. 30 C. + 10 C. - Hornussen (national game). 40 C. + 10 C. - Alp Horn Blowing. The surtax on these stamps benefited needy mothers. The souvenir sheet shown above (Zu. WIII #32, Mi. Block 14, Sc. #B206) was issued on September 29, 1951 for the National Philatelic Exhibition (LUNABA), held in Lucerne from September 29 to October 7, 1951. 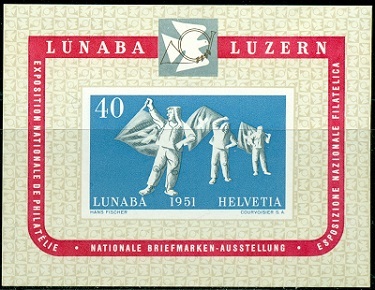 The proceeds from the sale of these souvenir sheets benefited Swiss Schools Abroad. This is the companion stamp to the lower denominations of the 1945 Pax commemorative stamp series. This 05 C. + 10 C. denomination stamp was issued on May 9, 1945, and, except for the background color, it is almost identical to the 5 C. denomination stamp of the Pax series (Zu. WIII #24, Mi. #464, Sc. #B145). The surtax benefited the Red Cross.